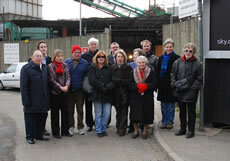 Residents from the area surrounding Horn Lane gathered together on Tuesday this week along with Angie Bray, Conservative parliamentary candidate for Ealing Central and Acton, Cllrs John Ross, Jim Randall and a dozen others to raise their concerns about pollution coming out of the Horn Lane Waste Transfer Site. A man was gravely injured there last week and taken by air ambulance to the Royal London Hospital. We have heard from the Health and Safety Executive that they are still investigating the incident, along with the Metropolitan Police and other government agencies. Ms Bray and the local councillors were supporting residents in their campaign to reduce the pollution that blights the area around Horn Lane largely from the remaining industrial sites and the heavy goods vehicles accessing them. The residents believe it is now time to rezone the area making it primarily a neighbourhood for offices and housing, rather than for industrial use. Comments on the W3 Discussion Forum over the past few weeks about the Waste Transfer Site range from deeming it "completely unsuitable for the area" to "I knew the area was bad, it's actually horrific!" Hayes Thompson said he had noticed "fires so big you can see the flames from the junction of Horn Lane and Friary Road. Of course, you can smell the smoke, too. Is that legal?" Rosco White commented: " I'm still completely mystified as to why all these filthy, polluting industries are allowed to continue operating in a heavily residential area, despite their long proven ill effects on health." Other residents have also mentioned noise pollution as a problem for those living close-by. Many of the firms start operations well before 8:00 am and there are complaints of constant beeping all day from numerous vehicles, along with constant banging and crashing of skips and materials. We spoke to Vib Patel, who for 30 years has lived and worked close-by. He runs Jallas Chemist a few doors along from the Yard. "This is not the first time we have got MP's down here to try to raise awareness of the terrible pollution. The Association of Shopkeepers have also tried to do something but nothing happened. "I was interviewed for BBC News 24 three years ago. This stretch of road is one of the most polluted in the UK with extremely poor air quality. Over the past 30 years, the yard has expanded three-fold." There has also been a recent application to Ealing Council made by Gowing and Pursey to construct a temporary building. Residents say they will oppose the application. Mr Patel says that on clear days the clouds of white dust caused by the breaking up of concrete is clearly visible: "In my opinion, the biggest problem is caused by Yeoman's Aggregates (now under the umbrella of Aggregate Industries). If I clean my car, it is literally covered in dust again two days later." Reports show that the area is the second most polluted site in London, with no signs that anything is being done about it. Residents point to research published in 2006 by Gary Fuller of King's College London. The report states that there is increasingly strong evidence of very large breaches of the EU Limit on particulate pollution and identifies Ealing as the worst area affected by PM10 particles. These have been identified as causing respiratory problems, cancer, alzheimers, atherosclerosis and permanent declines in lung capacity. Reports on the Ealing Council website indidate that European Union stipulated PM10 levels are not being met at the Horn Lane site, but that they have decreased somewhat since initial readings were taken. However, we were not able to find data beyond 2007 levels. Angie and local Councillors John Ross, Jim Randall and Council Candidate Thomas Sweetman have already taken their case to the Leader of the Council’s office to urge a rethink on the current status of the site. Angie said: "The arrival of Crossrail at Acton Mainline station provides the perfect opportunity to make an important change to this area. These industrial sites are really a relic from Acton’s past. Crossrail will bring huge extra demand for homes and offices with easy access to transports links in and out of central London. I’m sure the Council will want to consider this." A spokesman from Ealing Council said: ""As plans progress for Crossrail to come to Acton Main Line, we are looking at the planning status of this area. As part of that work, over the long term, we are considering whether Horn Lane is the most appropriate location for this type of industrial use or whether the site would be a better location for more residential and office development." Asked about what Ealing Council were doing to monitor the situation, their spokesman said: "We have for a long time monitored air quality in Horn Lane and in the last few years there has been a reduction in pollution after we successfully prosecuted one of the businesses on the road. "More than a year ago a change in the law meant the Environment Agency took over responsibility for regulating that particular industrial site and they would be responsible for any future enforcement action. Council officers are still monitoring pollution at Horn Lane and will liaise with officers in the Environment Agency about these issues." Gowing and Pursey, one of the industries who operate out of the Horn Lane site have been contacted for their comments. On their website, a statement reads: "We are fully compliant with current environment legislation and are committed to recycling wherever possible, we pride ourselves on being environmentally friendly." Aggregate Industries have also been contacted.